Our ‘Notes for Women’ concert at St George’s Bristol on 28th April will include Isabella Leonarda’s Sonata Duodecima, believed to be the first violin sonata composed by a woman. The name simply means ‘twelfth sonata’ and is the last, and most harmonically advanced, of a set published in 1693 (the first eleven sonatas are for two violins and continuo). It is divided into seven sections. We will be playing one of the two-violin sonatas (Op.16 No.1) at Henleaze on 3rd November and at Nailsworth on 18th November. Anna Isabella Leonardi (she later swapped the ‘i’ for an ‘a’) was born in 1620 in Novara, 40km west of Milan, to the lawyer Giannantonio Leonardi and his wife Apollonia, members of a prominent Novarese family. Little is known about her early life. At age 16 she entered the Collegio di Sant’Orsola, an Ursuline convent, where she remained for the rest of her life. Her family were benefactors to the convent, which perhaps contributed to Isabella’s influence there. In 1658, aged 38, she is mentioned as being a music instructor, and during her life she took on many of the roles and positions of authority within the convent, including mother superior and ‘counsellor’. It is possible that she studied with composer Gasparo Casati, who was maestro di cappella of Novara Cathedral around the time that Isabella entered the convent. He included two of her compositions in a book of music he published in 1640. Although she probably composed music throughout her life, all of her publications (other than those in Casati’s collection) came after Isabella was fifty in 1670, and continued until 1700, four years before her death at the age of 84. She noted in one of her dedications that she only wrote music during time allotted for rest, so as not to neglect her other duties within the convent, so it is possible that she was able to find more time for composition during her later years. 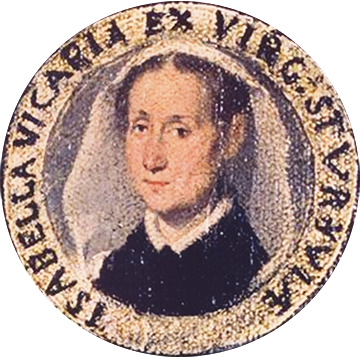 Although she was highly regarded in Novara, it appears that Isabella was little known elsewhere, and there is no evidence that she was known as a singer or instrumentalist. 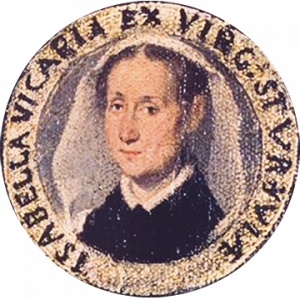 Isabella was a prolific and skilful composer, writing around 200 compositions, primarily of sacred music (including masses, psalm settings and motets), often for various combinations of voices plus organ, although she included instrumental sections in some of her works. Almost all of her publications are dedicated both to the Virgin Mary and to an influential living person (including the archbishop of Milan, the bishop of Novara, and the Holy Roman Emperor Leopold I), probably as a way of seeking financial support for the convent. The Opus 16 sonatas are believed to be the earliest instrumental sonatas to have been published by a female composer. They were published in 1693, when Isabella was 73, but had probably been composed earlier in her life. The first edition is an example of music printing using moveable type, where each note and its block of staff lines is printed from an individual block of metal type, with the rows for each page being assembled by the printer from the appropriate combination of blocks. This was a quick and cheap way of printing music in relatively short runs. However, it can be quite difficult to read, and does not allow for beams across notes and some other notational features (although sometimes these were added by hand). 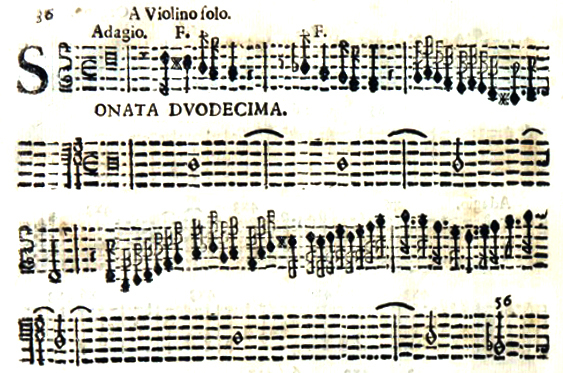 The more flexible and elegant (though expensive) technique of music engraving had already been in used for 100 years by the time Leonarda’s sonatas were published, so the fact that they were printed in this way indicates the publication’s relatively lowly status and the limited budget for its production.